Celiac disease, also known as gluten intolerance, is a genetic disorder that affects at least 1 in 133 Americans. Symptoms of celiac disease can range from the classic features, such as diarrhea, weight loss, and malnutrition, to latent symptoms such as isolated nutrient deficiencies but no gastrointestinal symptoms. Those affected suffer damage to the villi (shortening and villous flattening) in the lamina propria and crypt regions of their intestines when they eat specific food-grain antigens (toxic amino acid sequences) that are found in wheat, rye, and barley. Oats have traditionally been considered to be toxic to celiacs, but recent scientific studies have shown otherwise. This research is ongoing, however, and it may be too early to draw solid conclusions. "Because of the broad range of symptoms celiac disease presents, it can be difficult to diagnose. The symptoms can range from mild weakness, bone pain, and aphthous stomatitis to chronic diarrhea, abdominal bloating, and progressive weight loss. If a person with the disorder continues to eat gluten, studies have shown that he or she will increase their chances of gastrointestinal cancer by a factor of 40 to 100 times that of the normal population. Further, gastrointestinal carcinoma or lymphoma develops in up to 15 percent of patients with untreated or refractory celiac disease. It is therefore imperative that the disease is quickly and properly diagnosed so it can be treated as soon as possible." Gluten is the germ part of the wheat grain. The germ is closest to where the grain grows to the stalk. It is the highest source of protein of its counterparts. This is the part of the grain where the most gluten is stored. 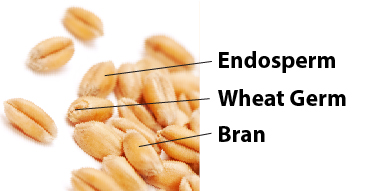 The endosperm section comprises over 80% of the grain and is where most of flour comes from. Bran is the outer husk of the kernel. It is the edible portion that is not digestable by humans. Soluable fiber, like in wheat grain, helps food to pass through the intestines. Whole grain foods include all of these parts of the kernel. In regards to wheat, it is important to note these subtle nuances in product labelling. When baking with a Gluten Free Flour, if there is no Xanthan Gum added to the flour already, then do the following: For Cakes, add 1 tsp. Xanthan Gum to 3 cups GF Flour. For Breads, add 2 1/2 tsp. Xanthan Gum to 3 cups GF Flour. Adding applesauce, pureed fruit or yogurt to recipes helps gluten-free cakes, muffins and quick breads stay moist. Adding shredded or desiccated coconut, chopped nuts, dried fruit, and chocolate chips also goes a long way to improving texture and flavor. Start with adding one half cup to your favorite recipe. Experiment and have fun. Use organic light brown sugar instead of refined white sugar. It boosts moistness and flavor. Honey is a humectant and adds moistness (use less liquid in the recipe if you use honey). For milk substitutes in baking, gluten-free soy, rice and nut milks work very well. Use plain for a neutral flavor, or vanilla/chocolate for a flavor boost. Coconut milk also works.